If your Booktype account has administrator privileges, you will see an extra link to 'Control Centre' underneath your user name in the top-right corner of your browser window. 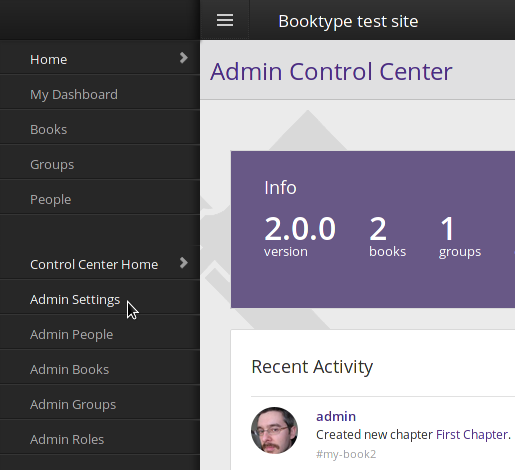 Clicking this link will bring you into Home view of Booktype's Admin Control Centre. This view provides you with an overview of the resources and current activity on your instance of Booktype. Displayed here are the Booktype version; the total number of users, books and groups on the system; the amount of disk space being used by the Booktype database and by the files it is organizing; the Online users who are currently working on their books; and a timeline of Recent Activity. 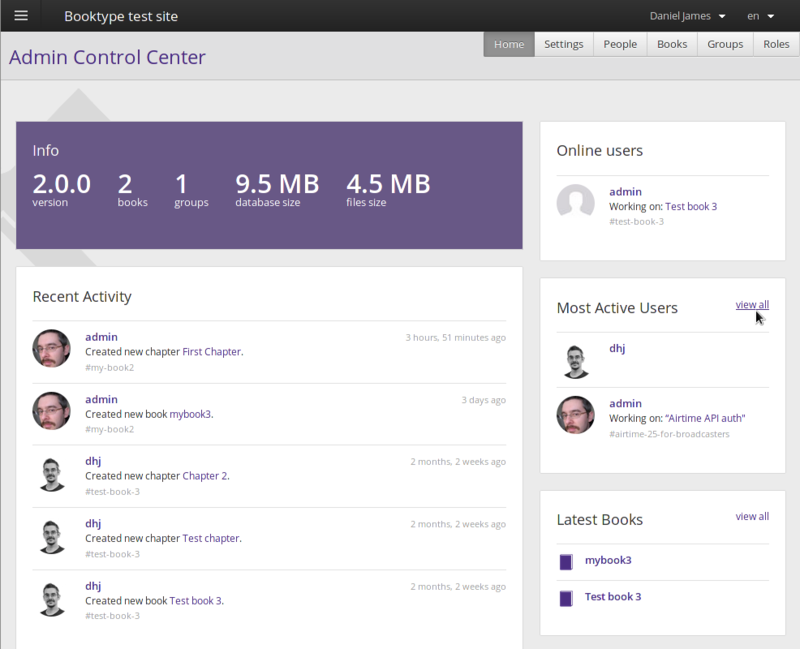 There are also boxes showing the Most Active Users, Latest Books and Most Active Books . You can get back to this overview any time by clicking the Home button in the grey navigation bar at the top right of the page. The other links available in the navigation bar are Settings, People, Books, Groups and Roles. This navigation menu is also available by expanding the left sidebar, after clicking the three-line menu icon in the top left corner of the page. Tip: Clicking the name of the Booktype instance at the top of the page takes you out of the Control Centre and back to a normal user's view of the instance. The Settings section enables you to make a number of important changes to your Booktype instance. The settings are grouped into a number of sub-sections. Here you can set or change your site's title, tagline, and favicon (the small icon that appears next to your site's address in a web browser). If you're familiar with CSS (cascading style sheets), this is where you can make custom changes to the look and formatting of your Booktype site. Here you can change the Welcome message which is seen by users and visitors when they arrive at your Booktype site, and control whether or not a timeline of recent activity is displayed with the checkbox Show activity. You can also opt to show different front page elements to 'anonymous' users, i.e. anyone who isn't logged in. You can set a special welcome message, contact email address and image to be shown to anonymous users if the Use anonymous page option is selected. When a user creates a book, they can choose from a number of copyright licences under which the book will be published, including 'All rights reserved' if you wish to allow that. 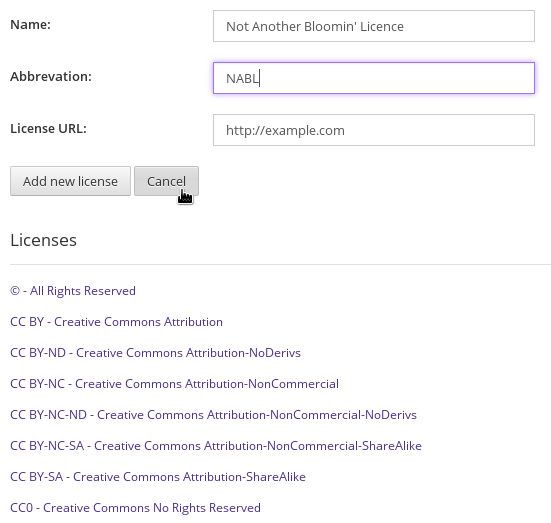 Booktype comes pre-configured with a selection of the most popular licences for creative works, and these are listed under Licences. Please note that if you wish to enable authors to upload content to your Booktype installation which is not under a free culture or other open licence, you will need to have copyright agreements in place with the relevant rights holders. The Default visibility setting defines whether or not a newly created book can be seen by other users. Irrespective of this setting, an author can still choose to change the setting for his or her book at any time by following the Edit This Book link, clicking the Settings tab and choosing from the options available in the relevant drop-down menus. The Track changes setting will enable or disable Booktype's track changes functionality for all users. The Default Licence drop-down menu enables you to set which copyright licence newly books will be placed under by default. If you choose the null option at the top of the list then no licence will be automatically set. Again, an author can of course override the default choice and opt for any of the available licences. Here you can choose what role will be set by default for anonymous users and registered users. Booktype contains a number of pre-defined roles. 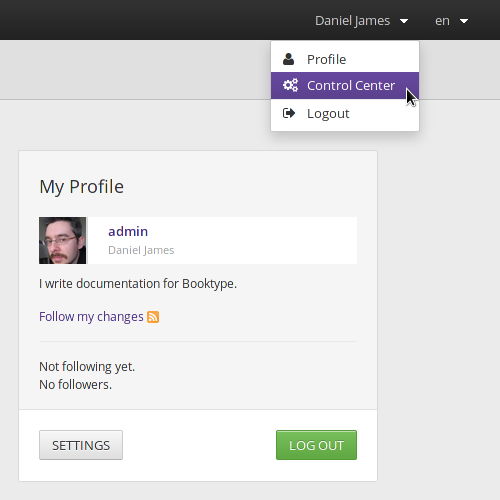 You can edit these pre-defined roles and add new roles in the Roles section of the Control Centre. The Privacy section contains three options. The Anyone can register checkbox sets whether or not an unregistered visitor to your Booktype site can make an account for themselves. If you opt not to allow this, you can make accounts for users by clicking the Add New Person link in the People section, as described below. 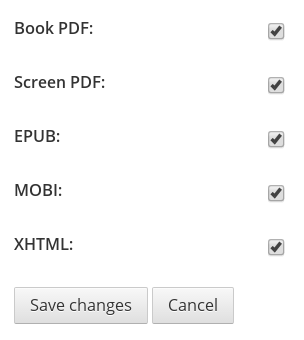 The other two checkboxes control who can create and import books. Leave them unchecked if you would like your users to be able to create and import books themselves. One of the Booktype's strengths is the ability to publish books in a range of formats. 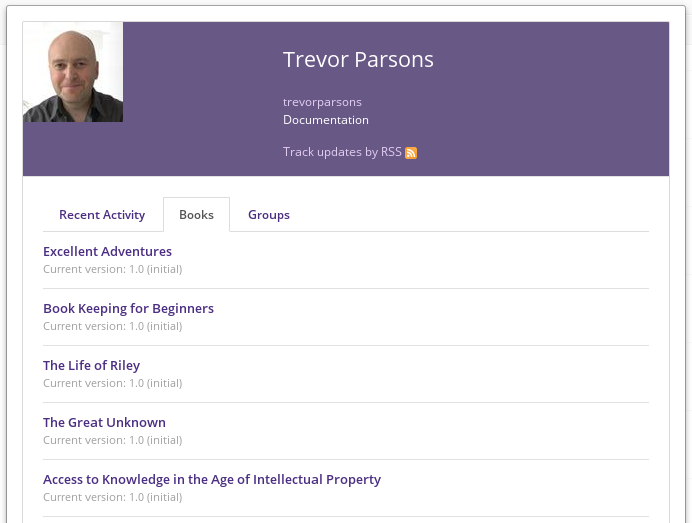 Here you can choose which formats you would like to be available to your users when they hit the big purple button to publish their books. By default all available publishing formats are enabled. These options are described in the chapter Exporting a book. 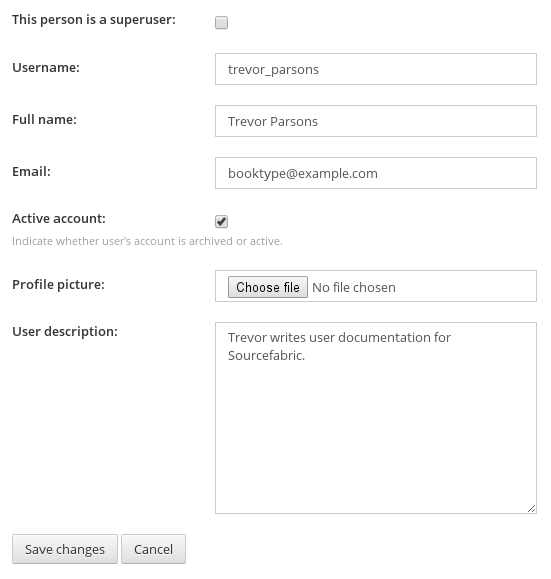 Any Booktype user can view the other users who are registered on the site, but a user with access to the Control Centre can click on the People link to make various changes to other users' accounts. Clicking on the Add a New Person link in People brings you to a screen where you can add a new user. 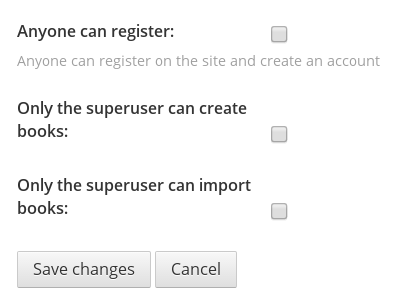 This will be the only way of adding new users if you opt not to allow unregistered visitors to create an account for themselves (see Privacy above). 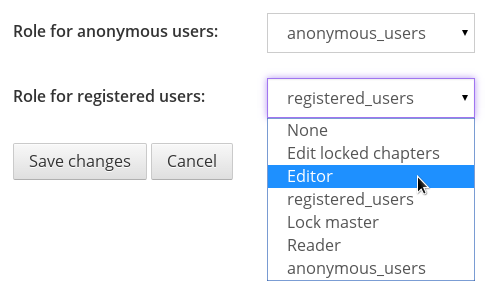 Selecting a username from the List of People will bring you to a summary of information about that user's account on your Booktype site, showing the user's recent activity, books and groups. Back in the List of People, as you move your pointer over each person in the list of people you will noticed that two buttons appear: Change Password and Edit Info. The facility for changing the user's password is self-explanatory. Edit Info brings you to a screen where you can change key details of the user's account: Username, Full Name, Email, Active account and User Description. You can also upload a new profile picture for the user. 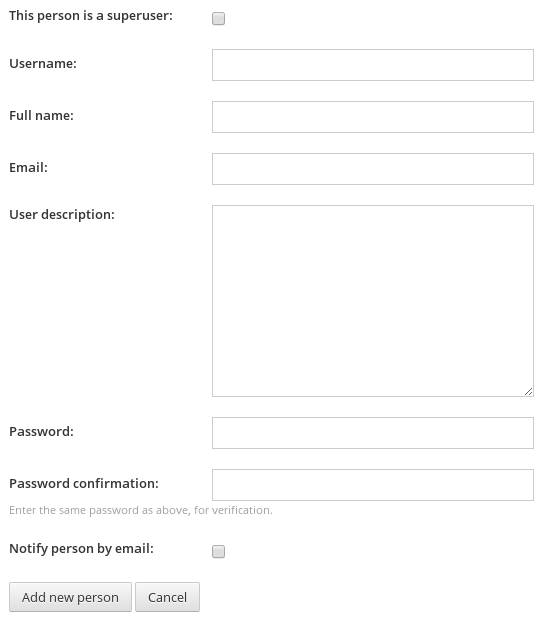 This page lists the users who do not have the Active Account checkbox enabled, and are therefore unable to log in. Booktype does not allow deleting user accounts, as historical information may be required for copyright attribution purposes later. 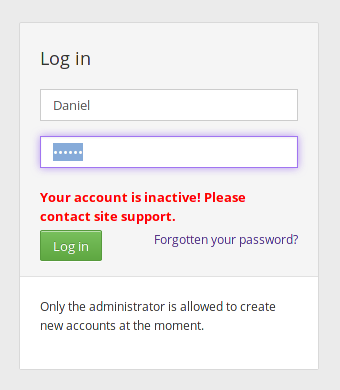 If an archived user attempts to log in, they will be shown a message indicating that they need to contact the support team.